Here is a stylish, yet practical, way to keep your favorite drink at the right temperature. 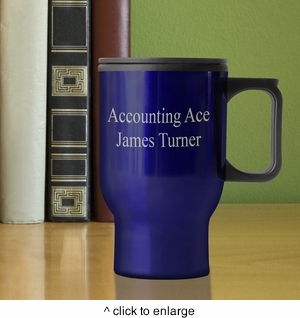 Our Personalized Travel Mug is a great gift for the executive on the go or busy college student. The mug features a long sturdy base and large handle and is available in two colors. Includes a secure lid to minimize spills. Holds 12 ounces. Dishwasher safe. Personalize with 2 lines up to 15 characters per line.